We hire out marquees for a range of a events across East Anglia. A marquee is a stunning alternative option to a conventional venue, offering your guests a spacious and relaxed atmosphere no matter what the occasion. A marquee can be whatever you want it to be. Think of it as a blank canvas. You get to choose the colour scheme and design style and you’re not bound by the existing decorative state of a room or building. If you’d like more help or information, get in touch on 01953 882 394. Marquees also give you great flexibility in terms of how big your event space is. So if you’ve decided to invite more guests, then simply increase the size of the marquee you’re going to hire with Weatherill Brothers. Marquees also lets you choose the backdrop for your event. Whether there is a particular view you love or a favorite space, such as the family home’s back garden, we can help you to design a marquee that makes the most of the surroundings. 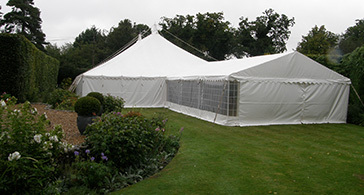 Marquees can be used for a variety of events, from weddings and family parties to corporate events and training days. Just get in touch with a member of our team to find out more about what we can do for you.